If years ago ultrabooks were something new, unusual and rare, today this segment of notebooks is already mass and any self-respecting brand offers in its portfolio at least several such devices. Among the various ultrabooks however, rarely distinguish genuine masterpieces such as this in my hand. HP Spectre 13-v000nu certainly deserves due attention. Today will take a look at the design, comparing it with that of some competing models, test hardware functionality, display, peripheral and battery. And since Spectre 13 is literally a work of art, we will start with design. It definitely will appeal even more demanding in their requirements of users. Each element in the cabinet is selected and crafted with taste. This is no accident, because behind the vision of Spectre 13 which stands Stacy Wolff Global Head of Design of HP Inc. His aim was to create a full-fledged computer with Core-i processor in as thinner body. Definitely succeeded, but the size a bit. Let's look first common vision - the combination of colors, dark gray with brown and gold hues. 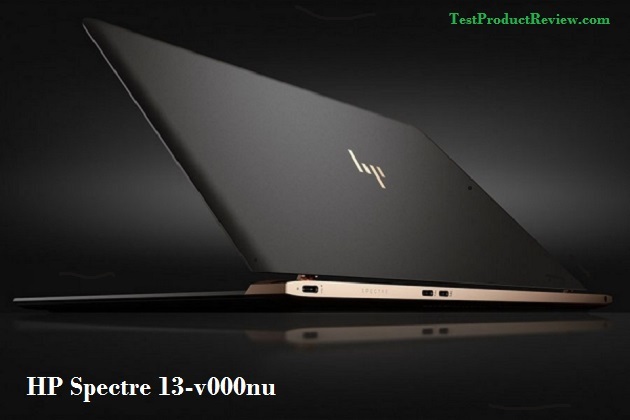 An interesting fact that we can not overlook is that the casing Spectre 13, HP did not use any plastic, except that strip below which are Wi-Fi and Bluetooth modules! The upper and lower lid are aluminum and magnesium alloy chassis. Cast elements is ideal test our gestures and direct pressure also found no appearance of crackled, squeaks and other parasitic noises. It is elegant, isn't it? Such unusual looks will appeal equally as many ladies with gold jewelry and gentlemen who have glamorous elegant look, completed by focusing metallic clock. Besides custom colors, HP Spectre 13 has interesting shapes. Front and periphery are rounded and somewhat typical of high-end brand. We look back, however, immediately find innovative thinking of Stacy Wolff and having put his "signature" by the new HP logo on the lid. How many millimeters you think is the profile of the thinnest Ultrabook in the world? Considering that the thinnest smartphone Motorola Moto Z is 5.2 mm thick, the figure should be at least 3-4 times higher. In fact, however, here we have a pleasant surprise - by comparison, the direct competitors Ultrabook in the face of Apple MacBook Air and the Dell XPS 13 are visibly thicker. We know that waiting exact figure - Intentionally or not, Spectre 13 is just 2 times thicker than the Moto Z - 10.4 mm from which the display is only 2 mm (be careful not to cut while opening it). Now that is called record. But creating a machine with such a thin display, the HP engineers have encountered an unexpected problem - none of the currently used openers could not fit the profile 2 mm. Decision as you can see was found - a special hinge mechanism which has a note - miniature gas shock absorbents that make movement smoother, firmer opening and closing slightly. As a result, even if you try to close the cover, it will not hit and cause damage. You can open and close with just one finger. At the maximum open position of 124 degrees, the display stand steady and not swaying like this than opening mechanism helps and ideal weight distribution throughout the body. Hopefully soon see this innovative technology with other notebooks HP, it is definitely because collar and practical. Speaking of practical solutions, let's turn Spectre 13 upside down. These three rubber strips act as support legs. You can see and new laptop models in the series Pavilion and Envy. Our tests indicate that the device on a flat surface with their help was far more stable and non-slip. Furthermore, due to the formation of channels cooling air circulates much better. Although Ultrabook has a full metal body design Spectre has active cooling at the rear. It then suggests a hardware device does not meet mobile processor Intel Core M, and a representative of the far more powerful Core-i series.